HEEL PAIN - PLANTAR PAIN | GEORGE D. GOUDELIS MD. Ph.D. Pain in the heel is a clinical entity often concern people not only adults but also children. It is a condition which can be the cause of restriction of physical activities so the person can not withstand their professional or sporting commitments. The pain may be localized to the plantar surface of the heel or on the posterior surface. Plantar fascitis - Calcaneus plantar spur: Painful heel condition that can affect both sedentary and active individuals and is most often seen in the adult population. Usually it happens to people with increased body weight in people with disorders of normal architecture of the foot as flat feet, pes planovalgus. In X-rays may have findings of heel spurs. The patients mentioned that symptoms - pain in plantar foot during the first steps after rest (sleep). 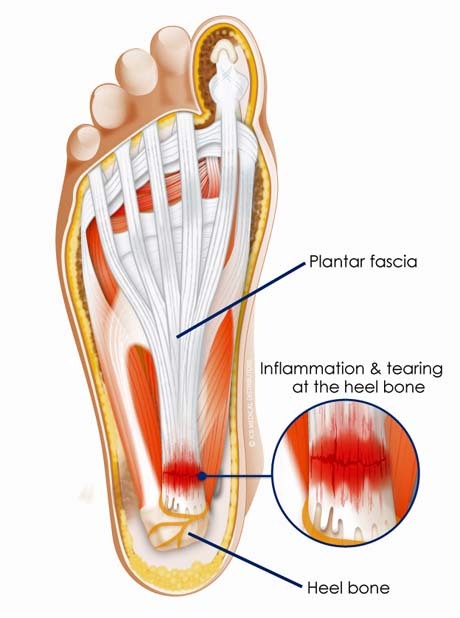 Flat feet can be the cause of inflammation of the plantar fascia and create heel spur. Baxter neuritis (compression of the first branch of the lateral plantar nerve). Baxter neuritis presents as plantar medial heel pain that can be difficult to differentiate from plantar fascitis.Νευρίτιδα του Baxter . Associated with athletes involved in running sports. Pain is located more medial over the abductor hallucis as compared to the more plantar pain seen with plantar fascitis. Calcaneal stress fractures. Most commonly in the active individual or military recruit. Periostitis. Pain and tenderness in the central portion of the heel pad. Represents traumatic periosteal or bursal inflammation secondary to a known injury or atrophic heel pad. 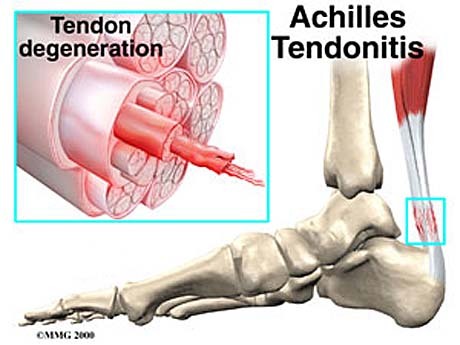 Tendinitis of the Achilles tendon. The Achilles tendon is the strongest tendon of the human body. Most often due to overexertion (overuse syndrome), or a major loading thereof without preheating, induced inflammation of tendon in the calcaneus insertion, resulting in persistent pain especially after physical effort and not necessarily during this. Retrocalcaneal bursitis. Between the anterior surface of the tendon and the posterior surface of the heel bone is the retrocalcaneal bursa which substantially eliminates friction between these two anatomical elements. Inflammation of the bursa is common in people who for professional or sporting reasons causing intense pain and local clinical inflammation (redness, swelling and increased local temperature) on both sides of the tendon. Haglund deformity. Haglung deformity refers to an enlarged prominence of the posterosuperior calcaneal tuberosity causes severe pain during the individual activities, but may cause pain and rest. WHAT OTHER CONDITION CAN CAUSE HEEL PAIN? Sever's disease. involves pain in the region of the heel associated with localized tenderness in the region of the calcaneal apophysis, together with X-ray findings of fragmentation and sclerosis. The calcaneal apophysis, which normally develops between the fifth and twelfth years, characteristically does so in irregular fashion. This region serves as attachment for the Achilles tendon superiorly and for the plantar fascia inferiorly. Malignant tumors: Ewing's sarcoma involving either the calcaneus or the talus is the most common hindfoot osseous malignancy.